The mechanical keyboard was amongst us a long time before the Internet ever got to your school. Then, they mostly vanished from consumer products and now they are making a comeback! First, it was gamers that we’re looking for something more reliable with some kind of physical feedback and the ability to type multiple keys at once, but now the enthusiasts are building them from scratch choosing the board, the switches, soldering it all together and spending a little fortune on designer retro-style keycaps if not limited edition single keycap for the ESC button! Where to start in this great new world? Well, WASD, maker of mechanical keyboard has a solution for you that takes great keyboard, a good selection of key switches and a super cool custom layout designer that let you customize the colours and fonts of your keyboard! To discover this WASD has provided us with a 61-key VP3 Custom Keyboard, often referred to as a 60% keyboard. We used the online design tool to make up a cool gradient keyboard that goes from beige to black from top to bottom and a little blue ESC key just the kicks. Basically, you select your layout and a general design. We selected the Mac layout and the big font with centred letters as well as the symbols instead of the words on shift, caps lock, etc. But what if you want to go all in and use a super custom font? Well, you can too! They provide a list of Adobe Illustrator vector files so you can add exactly what you want in terms of drawings or letters and font. It has been awhile since I wanted to try a mechanical keyboard at work, so I selected the brown Cherry MX key switches. They do not “click” when being pressed but you do feel a little resistance, hoping I can learn to type without bottoming out the keys. 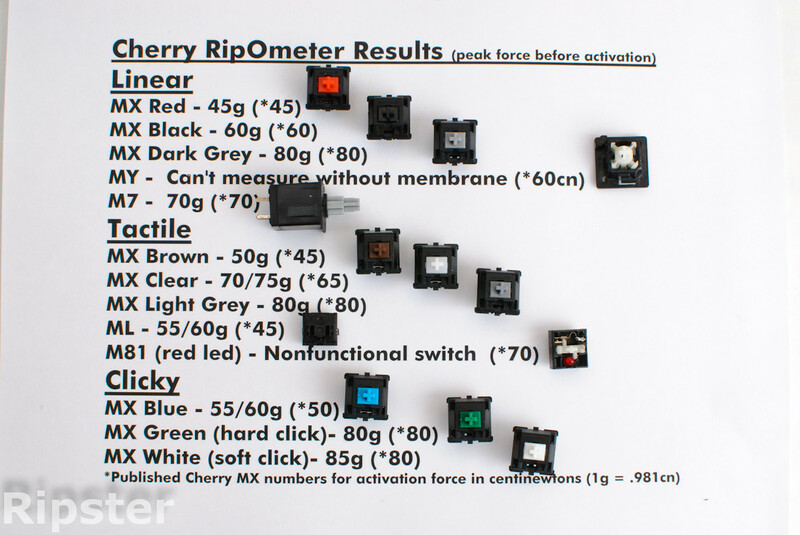 Key Switches of Rainbow Colours? Well, not exactly, Cherry the company behind the world’s most popular key switches do not have all seven colours, but since they’re in the business since the 1950s, they actually have many different key switches with their various features. Now, let’s get back to the WASD VP3 61-key mechanical keyboard. I’ll leave the details on switches and keys to another post I’ll write about this. The WASD 61-key comes complete in the box with a 60” mini-USB cable and a key puller tool to remove keycaps. With this you are ready to move around keys or replace with custom ones. The keyboard is much smaller than the usual keyboard you normally find on desk tops. By comparison, it’s only a few millimetres larger than those Apple Keyboards. The 60% layout is a full-size keyboard without the Num keypad, arrow keys or F-row. How can you write like that? Easy, you just map some keys and shortcuts. The WASD keyboard come with your customized selection of keycaps printed on ABS plastic and the base is made of metal, painted black. You also have generous slip pads under the keyboard to make sure it does not move. The four DIP switches below allows you to switch from QWERTY to Colemak or Dvorak and move around Fn or Pn. Finally, being a VP3 keyboard, this means that it can be programmed. You have a total of 4 layers, 3 out of those can be programmed. It’s a bit of a dance to get into a mode and program keys, but in the end you can have the perfect layout and key placement that will fit your typing habits, or nirvana! In order to replicate a simple layout, the Mac OS layout, I had a few things to move around. The CapsLock is first mapped to be an Fn key, this is done by setting the 3rd DIP switch below the keyboard to ON. Then I switch the Command and Option keys using Mac OS’s Modifier Keys under System Preferences so they are mapped to their proper physical placement on a Mac layout. By default, Fn+IJKL is already mapped to arrow keys, so nothing to do here. The only thing missing after that is mapping Fn+1..12 to be the Mac OS system keys (volume, brightness, iTunes controls, etc.). For that we need the help of Karabiner, a Mac OS utility that helps you remap keys. It was formerly known as Keyremap4Mac. There you have it! A close to the original Mac layout! WASD also provided two types of O-ring to damper the sound made by typing on a mechanical keyboard. I have both the small 40A-L (0.2mm, red) and the large 40A-R (0.4mm, blue) o-rings. The installation is very easy with the included keycap tool, you simply pop up the keycaps and slide the o-ring around the keycap peg, using the handle of the tool, you simply push them all the way to the inside of the keycap. What difference does it make? Well, here’s the audio version of the changes. Adjust your volume so that the mouse click at the beginning of the clip sounds similar to your mouse click on your desk. This will make sure you hear the volume close to “real life”. First, I start without any o-rings, Brown Cherry MX key switches naked. Then, I move on to the small o-rings and then the large o-rings. The o-rings really do make a difference, a very noticable one, but sadly they do not remove all the noise. Being on the stem of the keycap, they remove most of the noise when the keycap is pressed and hit against the back board, but when released, the spring shoots back the keycap back to its original position and hitting it there also makes noise. In a no o-ring situation, you get two clicks per key presses, one hitting the back board, and one when releasing. The o-ring actually remove most of the sound of the first one. I strongly recommend to try before you buy as the blue o-ring substantially remove travel distance and can change the overall feeling of typing on the keyboard. Personally, I prefer the red o-ring, the smaller ones, because they do limit the sound but not the travel distance too much. I tried to use it in an open floor type office, but it did not pass with my coworkers. :( Sadly even with o-rings, the sound the keycaps make when raised back did too much click-clack for my coworkers. I have since then tried Cherry MX Red with the same result and the only mechanical keyboard I could use is one with Topre key switches. More in a future review! If you have a closed office or solo office though, get your game on with this great keyboard. It’s very fun to type on! Of course, a big part of the performance of this keyboard will be subjected to your liking of the mechanical keyboard feel and the 60% layout. Let’s take into account that you would love both these things. The typing experience is very good on the WASD VP3 61-key keyboard especially if you like the type of key switch you selected. I’m satisfied with the Browns but I think I should get the Red next time. Where the WASD keyboard actually scores many points is the customization features their keyboard designer tool gives you. You have full control of colours, fonts and even very advanced draw whatever you want in a vector file kind of power. If you want to take your time, this can easily be the most affordable way to get a custom keyboard like nowhere else! They keyboard itself is made of very high quality material, and usually they are made by WASD themselves, but this new 61-key keyboard is actually a joint collaboration with Vortex Gear, makers of the POK3R, one of the most popular 60% keyboards out there so you know there are experts behind it. The high quality of Vortex plus the customization of WASD, you can’t go wrong! This keyboard is what I consider the best of both worlds. That is a quality keyboard made by real experts, and the customization power that normally only comes with a fairly big involvement in all things keyboard. Except, this time the tools made by WASD are accessible to anyone with time to tinker and make up the keyboard they really want! I’m very impressed by this keyboard and recommend it to anyone that would like to jump into the mechanical keyboard community as a first keyboard. You have enough personalization going on here to satisfy most fans. And the best thing is that it’s not expensive when compared to other similarly customized keyboards. If you have an idea of exactly what you want in terms of customization, the tools at your disposal will make this a reality! The 61-key VP3 keyboard is the latest keyboard from WASD. It has a 60% layout and can be customized to your preference online.